China has scrapped its quota system restricting exports of rare earth minerals after losing a World Trade Organisation (WTO) case. Beijing imposed the restriction in 2009 while it tried to develop its own industry for the 17 minerals, which are crucial to making many hi-tech products, including mobile phones. Last year, a WTO panel ruled that China had failed to show the export quotas were justified. 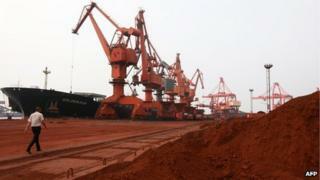 China dominates rare earth production. It is estimated to be responsible for 90% of its production, despite only having a third of the world's deposits. The change was detailed in China's Ministry of Commerce trade guidelines, issued at the end of December. Under the new guidelines, rare earths will still require an export licence but the amount that can be sold abroad will no longer be covered by a quota. The United States, the European Union and Japan had complained that China was limiting exports in a bid to drive up prices. The complaint, upheld by the WTO, also said the quota was designed to gain market advantage for domestic producers with cheaper access to the raw materials.